25 years ago, the first monsters were presented at IFMA. The 821 is designed to represent exactly the same virtues that make the first monsters 900 so unique: the perfect combination of rich performance, easy controllability and radiance. What’s new about Monster 821 from 2018? The headlight has been changed. The big sister, the monster 1200, is orientated. A halogen bulb is used as a normal light source. In addition, there is the LED daytime running light in hoof-in-shape. LEDs are also installed in taillight. The Monster 821 has a warning light function, which is activated by keeping the left turn signal flashing for 4 seconds. 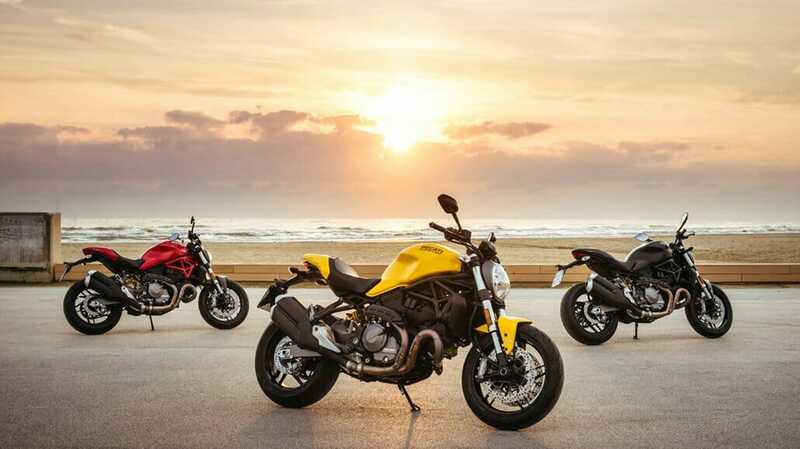 Like the Monster 1200, the 821 is also considered to be a slim and compact motorcycle with sports character. For this reason, the designers paid particular attention to the tank, which is slimmer and more modern. In the reworked design, the stylistic monsters from 1992 are to be found again. To that again highlight the anodized aluminum retaining clip comes back to the tank. The new muffler is optically derived from the Monster 1200 R and is EURO 4 compliant. The rear is short, compact and slim. A classic grate tube frame is used. Desmodromically controlled 821cc Testastretta with 11 ° L-Twin. Power of 109 hp (80 kW) at 9,250 rpm. – 86 Nm at 7.750 / min. EURO 4 compliant. It is integrated in the lattice tube frame as a supporting element. The engine is to have an excellent throughput across the entire speed range and thus offer both beginners and experts alike unpretentious and expressive driving pleasure. 43 mm forks. The shock absorber is adjustable in pretension and rebound damping. 10-spoke light-alloy wheels in 3.50 “x 17 front and 5.5” x 17 rear. First tire: Pirelli DIABLO ROSSO 3 in size 120/70 front and 180/55 rear. Front: Two radial-mounted Brembo M4-32 Monobloc 4-piston fixed calipers with 320 mm brake discs. Rear: A brake (the same Brembo as on the front) that can bite into a 245 mm brake disc. This is where the Ducati Safety Pack (DSP) is used. It consists of three-stage ABS, eight-stage traction control and ABS. There are three different riding modes. In “Sport” the full power is delivered directly and the DTC intervention is reduced. ABS works at level 1 – with the lift-up function of the rear wheel deactivated. In “Touring” the full power is unfolded, but a little softer. DTC intervenes earlier and the ABS works at level 2 – with a moderately effective lift-up function of the rear wheel. In “Urban” the engine power is limited to 75 hp. DTC intervenes earlier and the ABS on stage 3 provides the highest braking stability – the lifting of the rear wheel is prevented. A quickshifter (automatic switch) including blipper function (also for shifting down the gears without actuation of the clutch) can be ordered optionally. The TFT color display has gear and fuel gauge. By repositioning the reading should work better in bright daylight. There are three different display layouts. Optional is the Ducati Multimedia System (DMS) with which the display via Bluetooth module can be coupled with the smartphone.